Last week, the Patriots played in their bend-but-don't-break nickel defense for the majority of the game against the Steelers dangerous aerial attack. They'll likely pull a complete 180 from that approach this week, as the Bills figure to be one of the most run-heavy offenses in the entire league under new coordinator Greg Roman. In San Francisco, Roman ran a successful offense built around a power rushing attack and the mobility of his quarterback. True to form, his Bills offense ran 36 times against the Colts week one, with new quarterback Tyrod Taylor attempting only 19 passes all game. Expect the Pats to adjust accordingly with a lot of base defense. That means linebacker Jerod Mayo will likely see a lot more than the 11 snaps he played last week. The defensive line personnel will likely be adjusted as well, with 262 pound sub rusher Geneo Grissom likely ceding most of his workload to a rotation of big bodied defensive tackles Malcom Brown, Sealver Siliga and Alan Branch. 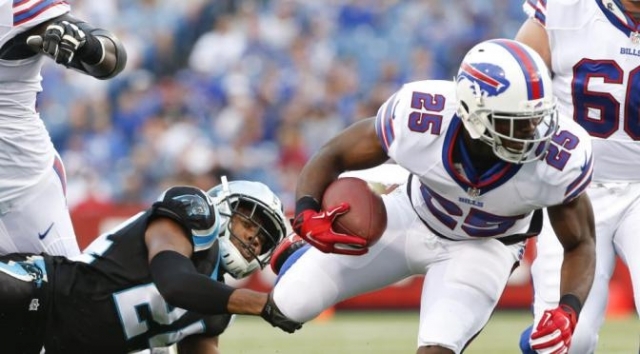 The Bills rushing game will be hoping to get contributions from star halfback Lesean McCoy, who is listed as questionable with a hamstring injury that has lingered since training camp. When healthy, McCoy is one of the game's most dangerous open field runners, but he only managed to generate 41 yards from his 17 week one carries (a measly 2.4 yards per carry average). Regardless of how healthy he is, the Patriots will have to tackle much better against his shifty running style than they did last week, when they allowed DeAngelo Williams to break a whopping 8 tackles. The availability of Shady will determine how big backup back Karlos Williams' role is, but the bruising rookie will get some carries regardless. A big (listed as 231 pounds) back with some downhill explosion, Williams led the Bills in week one with 55 yards and a touchdown on only six carries. If McCoy plays, Williams will be rotated in as a change of pace to keep him fresh. If McCoy sits, Williams figures to get fed carries, with third-stringer Boobie Dixon becoming his backup. While the Bills commitment to the run couldn't be questioned, they weren't particularly effective on a per carry basis Week One. Their team numbers were inflated a bit by the spark Williams provided in his six touches and a handful of scrambles from Taylor, who has the wheels to do a lot of damage if given a crease. However, being unable to get Shady going against a weak Colts front wasn't a good sign for the offensive line, especially since they played half of their offensive snaps with a fullback (veteran lead blocker Jerome Felton) and another third of the snaps with blocking tight end Matthew Mulligan on the field. 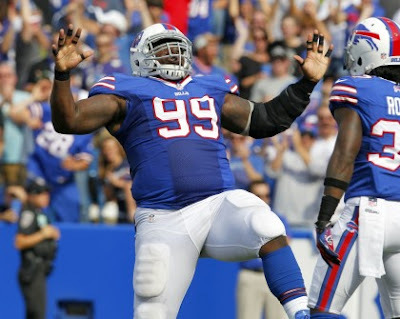 That offensive line has been rebuilt somewhat after being among the league's worst last season, but it should remain a cause for concern in Buffalo until proven otherwise. Newly signed guard Richie Incognito is a perfect fit for Roman's power rushing attack, and he responded with a good performance in his Bills debut. However, the right side of the line remains raw, with a rookie at guard (John Miller) and second year man Seantrel Henderson at right tackle. Henderson was roughed up quite a bit as a rookie, but has all the physical tools to play left tackle at this level, while Miller was a solid road grader at the collegiate level for Louisville. Given that inexperience, it wouldn't be surprising for the Bills to direct their rushing attempts more to the left side, where they'll be running behind a solid veteran trio of left tackle Cordy Glen, Incognito and center Eric Wood. Regardless of where they run, it will be key for the Pats to win the line of scrimmage with their big defensive tackles. Strong downhill play from their linebacking trio of Dont'a Hightower, Jamie Collins and Mayo will help as well. Stopping the traditional running game is one thing, but the Pats also face the challenge of containing Taylor's scrambling ability. "T Mobile" wound up with 41 yards on 9 rushing attempts last week, including a 31 yard scramble. Like last week, the Pats could turn to a "controlled rush" approach for their edge rushers, looking to compress the pocket and take away Taylor's escape routes. Even with a controlled rush, they'll be looking for more disruption from top trio Chandler Jones, Rob Ninkovich and Jabaal Sheard, who were all pretty quiet last week against the Steelers. 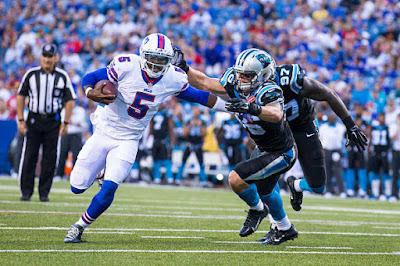 Taylor's open field speed has never been in question, but he remains unproven as a passer. The Bills reliance on their rushing attack protected him quite a bit last week, as he was hardly asked to carry the offense with his arm. Not only did Taylor only attempt 19 passes, but 15 of them travelled less than 10 yards down the field. He was efficient though, as he completed 12 of those 15 attempts and didn't commit any turnovers. He also took advantage when he did get the rare chance to cut lose, completing a 51 yard bomb for a touchdown to Percy Harvin. While the vast majority of Buffalo's offense came from their running and short passing game, that bomb served as a reminder of the dangers of overcrowding the short and intermediate areas of the defense. Buffalo doesn't throw often, but they do have a dangerous collection of weapons in the passing game. Despite his one target, zero catch 2015 debut, Sammy Watkins remains a dangerous number one receiver in the making, while Robert Woods has developed into a rock solid playmaking number two. Harvin is still one of the game's toughest tackles in the open field, with elite quickness and explosion and the versatility to line up all over the field and get the ball in a number of ways. Finally, Charles Clay is a mismatch creator at tight end who generated plenty of attention from the Patriots during his time as a Dolphin. With extra resources likely devoted to stuffing the run, it will be interesting to see how the Patriots match up with those skill guys. In the past, they've often used safety Devin McCourty to matchup one-on-one with Clay in coverage. If they turn to this, I'd expect Duron Harmon to take over McCourty's deep safety responsibilities, where he'll be charged with making sure plays like Harvin's week one touchdown don't happen. When McCourty plays deep safety, expect Patrick Chung to be in, spending the majority of his time in the box as essentially an extra linebacker. On the outside, Watkins talent should draw a matchup with Malcolm Butler, who is clearly the Pats number one corner after taking on arguably the league's top receiver in Antonio Brown and competing impressively with him. Expect Tarell Brown to be opposite him on the outside when the Bills play two receiver sets. The biggest question mark in the passing game could be Bradley Fletcher, who was picked on a bit by the Steelers and will have a tough matchup whether he winds up with Woods or Harvin. His strong open field tackling could be an asset against Harvin, who figures to get the ball on some quick hitting WR screens and similar plays, but he should get safety help over the top in that matchup. This is where the Patriots should really be concerned. Buffalo already had one of the league's toughest defenses, and now they add Rex Ryan, who has always given Brady trouble with his unpredictable blitz packages. They absolutely have the talent to slow down the Pats normally prolific offense and turn this one into a rock fight. That starts up front, where the Bills defensive line could absolutely take advantage of an inexperienced Patriots interior line. With center Bryan Stork on the shelf and veteran Ryan Wendell looking unlikely to play after missing most of practice this week with an "illness", the line figures to once again feature undrafted rookie David Andrews at center, with a rotation of Josh Kline and rookies Tre Jackson and Shaq Mason at guard. They'll only be charged with slowing down a line-up of All Pros up front. Marcell Dareus, he of the new $95 million contract, makes his season debut this week after serving a one game suspension. The massive 331 pound Dareus is both an immovable force against the run and a formidable pass rusher who will annihilate single blocking. He's joined up front by Kyle Williams, whose non-stop motor and country strength have made him a thorn in the Patriots side for years. Corbin Bryant rounds out their interior rotation, and he's coming off a productive game starting in Dareus' absence week one. The Patriots have more experience at tackle, but the veteran duo of Sebastian Vollmer and Nate Solder face a steep challenge as well. Buffalo goes three deep at defensive end as well, with the talented Alex Carrington backing up an all-star duo of Mario Williams and Jerry Hughes. Hughes has the kind of pure speed of the edge that has occasionally given Solder problems, while the physically gifted Williams has been a great all-around edge defender for the majority of his lengthy career. Buffalo's defensive line talent presents plenty of challenging physical matchups for the Pats up front, but the bigger challenge just might be identifying where the rushers are coming from. Rex has always been known for coming up with exotic fronts and blitz packages, and that continued last week, with formations like this. Thats a tough front to identify for a veteran offensive line, let alone one featuring three rookies in the middle. Needless to say, communication will be key up front. Communication could also be a challenge given the noise level expected from what figures to be a frenzied home crowd at Ralph Wilson stadium. Expect the Pats to turn to hand signals and silent counts. Tom Brady could also play a role in identifying the defensive looks and calling protections, taking some of that responsibility out of the rookie Andrews' hands. The Bills have had a talented group on the defensive line for several years now, but in the past, the story was that you could throw on their secondary if you managed to block them up front. That could be changing after an impressive performance from their corners against a deep and talented group of Colts pass catchers. 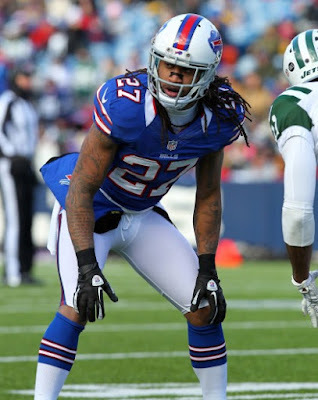 Former top draft pick Stephon Gilmore has blossomed into one of the league's most underrated corners (although I'd welcome him getting his wish of matching up one-on-one with Gronk), and second round rookie Ronald Darby has the physical talent to match up with guys one-on-one on the outside. Darby rotated with appropriately named nickel corner Nickell Robey for snaps opposite Gilmore week one, and all three had plenty of good moments. With Tom Brady likely looking to get rid of the ball quickly in order to minimize the time his line needs to hold up, it will be key for his receivers to get quick separation to give him an outlet. Rex knows that, and will likely have his corners playing tight man coverage. It will hardly be the picnic the Steelers provided with their big cushions and soft zones. Fortunately, Julian Edelman and Danny Amendola excel at using their quickness to get open quickly against man coverage. They are also both excellent after the catch, and those hidden yards will matter against a defensive of this caliber. LeGarrette Blount makes his season debut this week, but the Bills talent up front makes it unlikely for his power rushing style to be effective or a big part of the Pats offensive approach. When the Pats do run, I'd expect it to be mostly when they spread the Bills out, attempting to get them into softer nickel looks. Dion Lewis should get his chances to force Rex Ryan to learn his name. Instead, I'd expect the Pats to try to spread the Bills out and try to attack their third and fourth corners. As usual, the Patriots dynamic duo of Rob Gronkowski and Scott Chandler will be counted on to an offensive trump card, creating mismatches against even a defensive as good as these Bills. The Bills have a pair of good coverage linebackers in Preston Brown and Nigel Bradham, but neither is talented enough to hang with the Pats tight ends in coverage. Neither is safety Aaron Williams, no matter how much he dislikes the Patriots. Safety/corner hybrid Corey Graham is questionable after leaving Week One's game with a concussion, and his absence would be a big blow to a defense that will need all the coverage reinforcements they can get. 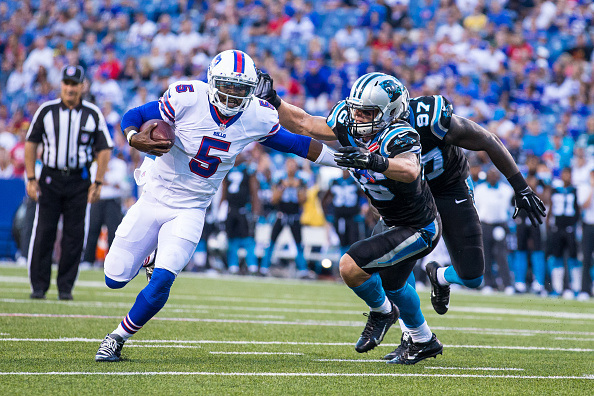 If this game turns into a defensive struggle, special teams could prove to be a huge factor. The Bills have a dangerous dual threat return man in Marcus Thigpen, but the Patriots should be able to contain him with the booming leg of Stephen Gostkowski and directional punting skills of Ryan Allen. The Patriots will be counting on Danny Amendola to give them a spark in the return game, as he appears to have taken over punt return duties from Julian Edelman in addition to his role as the primary kick returner. The Bills kick coverage team didn't look great last week against Colts return man Tyler Varga, so that could be a spot to try and pick up some needed hidden yardage. The biggest factor the Pats in this game will be overcoming what figures to be a very tough environment. The #billsmafia has more hope under Rex than they did in the last 10 years combined, and they are already pumped for their beloved Bills after the rousing season opening victory over the chic-pick Colts. Getting an early lead on the hated Patriots should throw an already rowdy crowd into a frenzy. Quelling that momentum early will make things much easier for the Pats, especially given the effects the crowd noise could have on communication with their young offensive line. The in game coaching battle between Rex and Belichick should be fascinating. There's no telling what kind of defensive schemes Rex has cooked up for this one, as his top goal throughout the game will be trying to make Tom Brady uncomfortable. Brady has historically carved the Bills up, but he's also had some of his worst performances against Rex-coached defenses. Something has to give here, and neither side will be going out without a fight.